instrument pickup ready -- NO DRILLING REQUIRED. 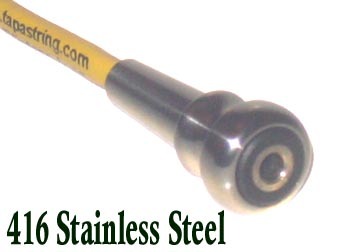 guitars, mandolins, and similar instruments equipped with taper fit end pins. 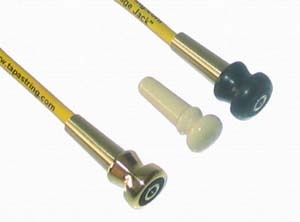 The "Vintage Jack"
is securely retained by the taper fit of the mating parts -- no adhesives required. 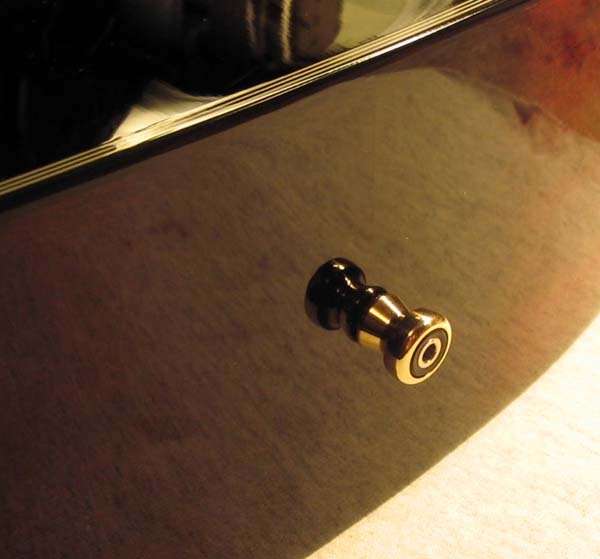 This material takes a very high polish and will complement the nickel or chrome plated tuners and other hardware found on some instruments. Or it may be just the thing for someone wanting a slightly more "High Tech" alternative to more traditional materials. The "Vintage Jack" comes stereo wired* with 18" leads of fully shielded mil-spec coaxial cable and is ready to be hard wired to your pickups. We include a heavy duty SwitchCraft or G&H plug (which must be soldered to your instrument cable) to assure positive contact and secure connection for superior performance and reliability. Complete output cable assemblies are available as an option. See our "Vintage Jack Cables page. *Compatible with both mono and stereo pickup systems. The "Vintage Jack" is also wired to provide battery switching for active pickup systems. We recommend professional installation to insure reliable connections and optimal pickup performance. 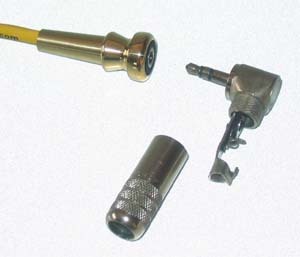 If you desire to do it yourself, instructions for connecting shielded audio cables are available here. Retail price $87.50 (brass or stainless steel models) Save $5.00 on internet orders. Use our Secure Shopping Cart and Order Yours Today.